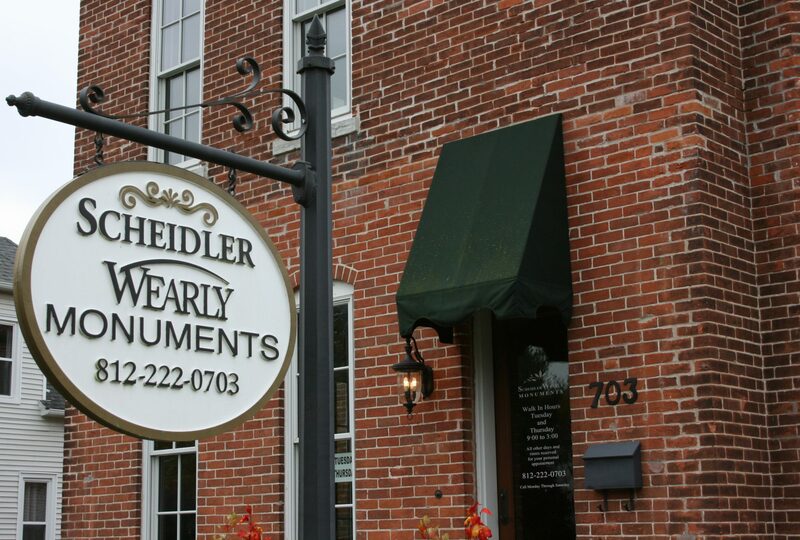 Scheidler-Wearly Monuments is locally owned by Diane and Dan J Scheidler. Our parent company, Wearly Monuments located in Muncie, IN, was established in 1899 with local representation since 1963. Our walk-in hours are Tuesdays and Thursdays from 9:00 a.m. to 4:00 p.m. If other days are more convenient or would like to guarantee a private appointment, call 812-222-0703 for a time that fits your schedule. Indoor and outdoor displays highlight traditional and specialty monuments. On your visit to our office granite colors, design options, shapes and sizes, specialty features, and pricing will be reviewed. We are available to assist you in creating a monument to fit your design and pricing needs. All other days by appointment to your schedule. Please call, use our "contact us" menu tab or e-mail: diane@scheidlerwearlymonuments.com .